By now some of you may be wondering why I choose to live like this. The question I get most from people, when they hear about my medical situation, is “Why don’t you talk about that?” Often, this sounds less like a question and more like an accusation: as in: “Why didn’t I know about that?” And herein lies one of the many dilemmas of being a closeted chronically ill person; if the idea is that I choose, willingly, willfully, not to openly disclose my situation to everyone I meet, then why is the response often indignant surprise with a veneer of anger when I do? While those who are also chronically ill usually seem concerned, I get the distinct impression that people who are not chronically ill themselves feel almost entitled to know everything about what’s going on with my medical life. I don’t know why this is the case, but I have some theories. I believe that today, in the twenty-first century, the age of social media everywhere and all that it offers, many people have come to expect unfettered access to a stunning amount of readily available information. Sometimes this information is of a very personal nature. Anyone can follow a celebrity on Instagram and immediately know what she ate for breakfast that morning. In today’s media saturated world, we have access to almost unlimited data; much of it what would probably be considered private in nature. With the click of a key, or the swipe of a finger, we can peer into the most intimate details of people’s lives; sometimes figuratively, sometimes literally. We now live in an era where privacy is no longer the expectation. In fact, some seem to see it as a sort of privilege. This, however, was not always the case. I realize that many people with chronic pain often long for a diagnosis, sometimes for (what must be brutal) decades at a time. It was the exact opposite for me. I was diagnosed at a relatively young age, in my early twenties, at a time when most young people (myself included) long to be seen as “normal” while simultaneously trying to forge a sense of self-identity from the bittersweet ravages of post-puberty. It was this internal struggle that ultimately led to my decision to hide my invisible illness from the world at large. Of course, those in my innermost circle had to know, because how else could I describe my reasons for staying home to rest rather than going out with my friends on a Saturday night? More often than not, as soon as I heard the car pull away, I was on the couch with a heating pad. I think that, more than anything else, it was my desire not to be seen as “sick” that made me do it. As a newly minted young adult, I didn’t want to be thought of as not fun, the one left behind, or even worse, not invited in the first place. It was also the early nineteen eighties, long before social media was a glint in someone’s eye. There were no understanding online communities, safely anonymous support groups, no way to quickly search for what each new symptom meant. My biggest fear was always that I would be ostracized from my own social community; one based largely on having fun and sharing experiences together. Turns out that my fears were not completely unwarranted; I have lost some friends along the way. With each additional diagnosis, or another surgery, certain people in my life have faded into the background. Some slipped slowly from the friend slot into the acquaintance one. Others disappeared entirely. In some cases, it felt like a natural progression, while in others it was a devastating loss. I guess you learn who your real friends are when the chips are down. 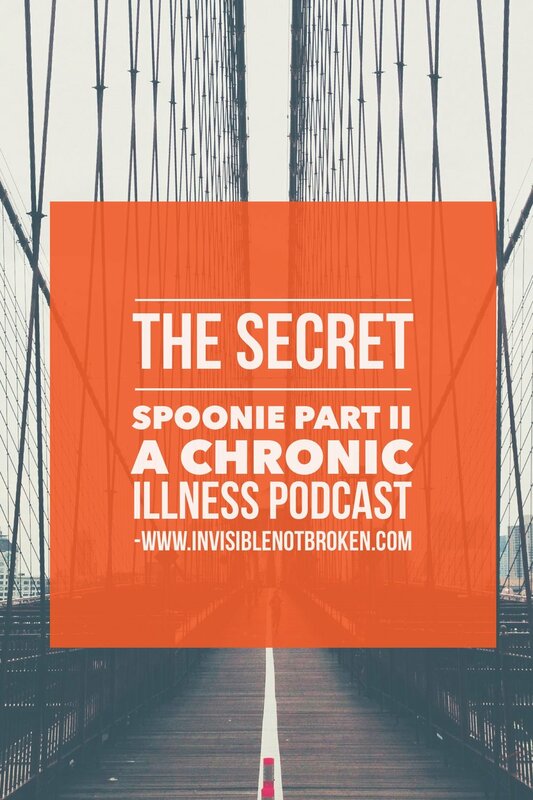 Maybe the best thing about being a secret spoonie is also the worst thing about it: If I’m able to effectively hide my invisible illness from people, I don’t get their condescending pity, but I also don’t get the sweet understanding. As many of you already know, being chronically ill is a challenge in many respects, both physical and mental, and sometimes we need a little help from our friends, even when (maybe especially when) we don’t want to ask for it. Having an invisible illness makes things both easier and harder; we can hide in plain sight, but we also risk not being seen when we want to be…when we need to be. Living in secret has served me well in some respects; in others, not so much. My choice to live like this has been both a liability and a form of protective armor: the paradox of being closeted and chronically ill.